Apple is a true miniature horse. She might look like our Haflingers, Hobo and Windy, or our small pony Jenny, but they are a different breed. Apple comes to us from a nearby farm. Apple has one blue eye and one brown eye. Isn't that cool? There's a great website about Miniature Horses called TheMiniatureHorse.com and they have this to say: "The American Miniature Horse is a unique breed, the limiting characteristic of which is size. It must not measure in excess of 34 inches in height, which is measured at the withers, at the last hairs of the mane. It must be a sound, well-balanced horse, possessing the proper conformation characteristics which are common to most of the larger breeds. 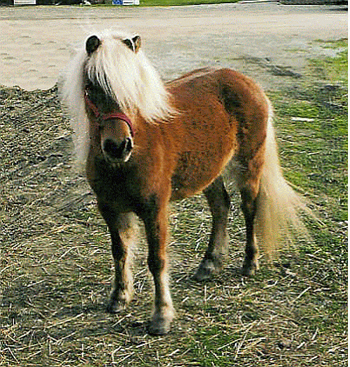 In fact, if there were no size reference, the miniature horse might give the illusion of being a full-sized horse. The American Miniature Horse gives the impression of strength, agility, and alert intelligence and is available in all possible colors." You'll love visiting our Mini, Apple, and be sure to look for her at your local fair! Visit TheMiniatureHorse.com to learn more about miniature horses. Images and Content © Pony Tales Farm. If you'd like to use any of the pictures on the site, please click here to e-mail for permission first!